Digital Transformation Powered by Enterprise Agility and AI! Enterprises globally are increasingly using technology and software as a competitive advantage. Digital Transformation has become one of, if not the, most important business transformation initiatives in the organization. The need to help customers easily interact with the company via self-service applications, the need to leverage large amounts of data to understand customer behavior and offer innovative data-based products, and to automate ever more of their business operations for greater throughput and efficiencies, has put pressure on these organizations to transform digitally utilizing Cloud-computing (or SaaS), Mobile apps, big data, AI and Machine Learning as also Robotic Process Automation (RPA). A big part of this effort is to adopt a Lean/ Agile culture and methods to develop new products and services, test them in the market, incorporate customer feedback and launch in rapid Plan-Do-Check-Act (PDCA) cycles to ensure they deliver the right products and services to the right customers at the right time! A massive disruption is taking place. New age digital companies are disrupting traditional markets, such as insurance, real estate, transportation and finance, constantly testing out various hypotheses in real time production environments. On the other hand, older organizations are trying to rapidly upgrade their infrastructure and software, as well as launch new digital products, in order to compete effectively with the new-age upstarts! Enter SwiftEnterprise 4.0 – the state-of-the-art solution for managing Digital Transformation and deliver Enterprise-wide Agility! SwiftEnterprise delivers a full-function Agile module that comes with full-function Planning and Execution Board features. Agile teams will be able to leverage a wide range of Agile capabilities to manage Agile projects much more easily and intuitively. At the same time, we recognize that while organizations are adopting Agile rapidly, they still manage legacy applications or execute large projects using traditional methods. They continue to run projects of different types – from Application Development and Maintenance (ADM) to Infrastructure Management Services (IMS). 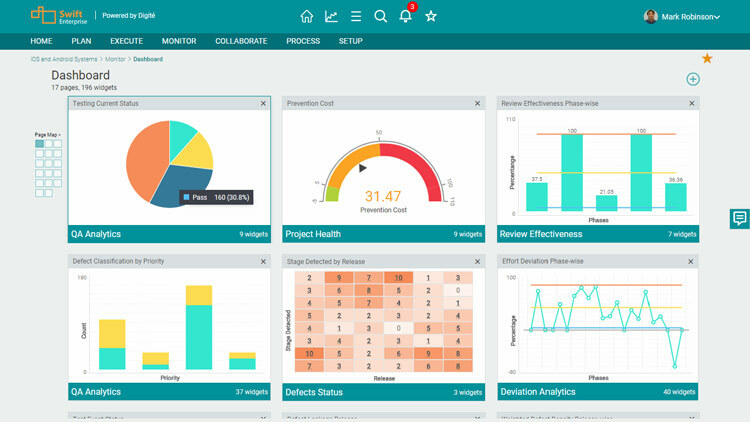 SwiftEnterprise combines it’s powerful Program and Project Management features with the Agile module in a single platform to help these organizations manage projects and applications using traditional, Agile or Hybrid Agile methods. Using SwiftEnterprise, your teams can execute large and complex Agile Projects. SwiftEnterprise has all the sophisticated capabilities of supporting multiple organization structures, roles, hierarchies, custom processes and rules – all that should be expected in an Enterprise-class Agile tool. Going forward, our direction will be to enable Lean and Visual execution capabilities to all projects types. We strongly believe this will enable our customers to accelerate their Agile Transformation and Continuous Improvement journey using Lean thinking across all their businesses. SwiftEnterprise builds on the strong foundational layers of SwiftALM that have been developed over the last 2 decades. Our existing capabilities in the areas of Process Governance, configurable transactions (Forms, Workflows and Rules), configurable Analytics and Integrated Notifications have time and again proved to be of very high value to our customers. SwiftEnterprise, like SwiftALM, will continue to support real-time bi-directional integration with over 50+ tools in the eco-system. SwiftEnterprise 4.0 incorporates our new UI/UX which helps a user at any level focus on what is the most important work items at any level that need their attention. The UI introduces a new Home page that helps the user focus on the most important items at any time. SwiftEnterprise also incorporates a new Dashboard, that helps managers and executives get all critical status at a glance – while being able to organize the dashboard in a highly configurable manner. 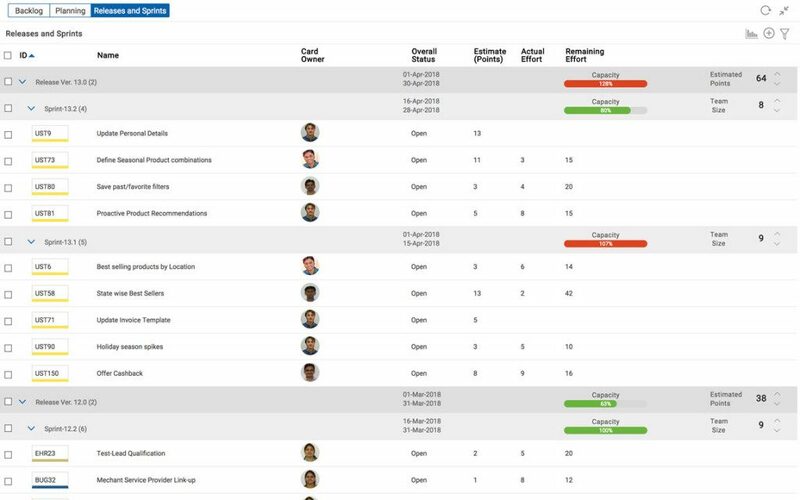 The new Project Planning and Execution Boards give the Agile module a new and modern look and feel, making it very intuitive for agile teams to use. All of these make for a modern and intuitive end-user experience – and boosts productivity for our customers. The SwiftEnterprise Mobile App comes with significant enhancements to our mobile offering and helping our users, especially project managers and senior decision makers easily stay in touch with their teams and their customers on the go. Projects in general, software projects in particular, have long suffered due to poor estimation and forecasting techniques. With Artificial Intelligence (AI) and Machine Learning (ML) techniques now available to be applied to structured and unstructured data sets, we now have the ability to look at a wide array of factors and make more informed predictions of what projects are likely to be successful while which projects have a serious risk. SwiftEnterprise comes with a rich capability to gather a wide range of project data and make predictions about project outcomes, while also recommending what alternative courses of action might be available to the project/ business leadership to steer the project in the right direction! If you are an existing SwiftEnterprise customer and would like to learn how you can upgrade to SwiftEnterprise, please contact Sales or your Support Point of Contact (SPOC).